It may be called a salad, but it sure doesn’t taste like your average one. 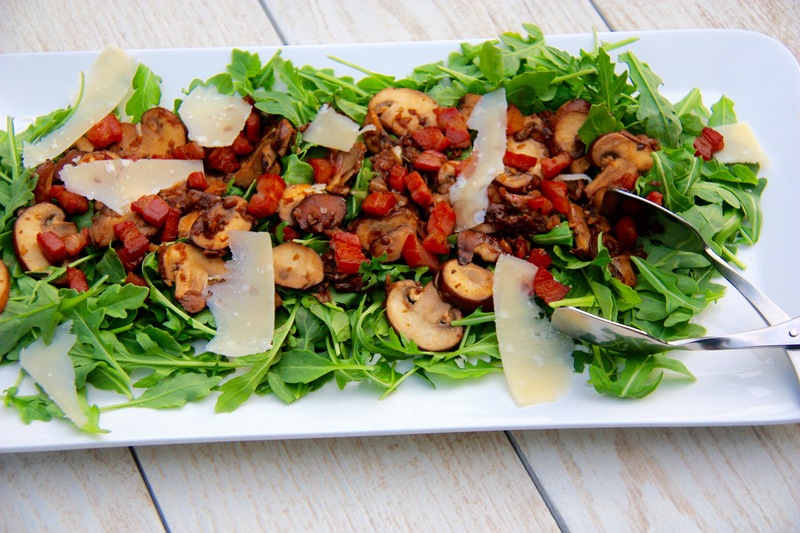 The juicy bacon and mushrooms are the perfect pair atop the zesty arugula. This is a perfect side dish or starter for a summer eves dinner. In a large saute pan, over medium high heat, saute the pancetta until it is crispy. Using a slotted spoon, remove the pancetta from the pan onto a plate coated with paper towel. Make sure the rendered fat from the bacon is still in the pan! Lower the heat to medium low and add the garlic and shallots. Add the mushrooms to the pan and raise the heat back to medium high heat. Toss the mushrooms until they are caramelized, about 5 minutes. Add the sherry vinegar and using a wooden spoon scrape up the brown bits at the bottom of the pan. Add the thyme leaves and season with salt and pepper to taste. To plate, sprinkle the arugula onto a platter. Pour the mushrooms and bacon on top and garnish with the parmesan shavings. Serve and enjoy!